THE NAMES OF 222 young children who died while in the care of Bethany Home have been publicly released. 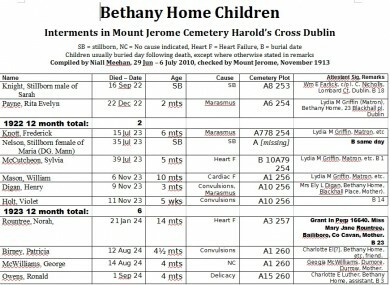 The document shows that many of the children who died at the Protestant mother and baby home in Dublin were just days, weeks, or months old. Some were stillborn. Some died of conditions such as marasmus (malnutrition); convulsions; ‘delicacy’; meningitis; German measles; syphilis; ‘general debility’; and heart failure. The deaths took place between 1922 and 1949. The identities and causes of death are being released at the same time as a memorial stone in honour of the children is unveiled at Mount Jerome cemetery in Harold’s Cross. Their details were researched from Mount Jerome Cemetery records in May and September 2010 by Niall Meehan, head of the Journalism and Media Faculty at Griffith College, Dublin. Meehan and Bethany Survivors’ Group member Derek Leinster said that relatives of the children may not be aware that a member of their family is buried in Mount Jerome Cemetery. It is hoped that the children may “gain a family” through the release of their names. To read the full list of names, click here. Email “Children died of malnutrition, syphilis, heart failure at mother and baby home”. Feedback on “Children died of malnutrition, syphilis, heart failure at mother and baby home”.